May 3, 2013 By Jenny Z. 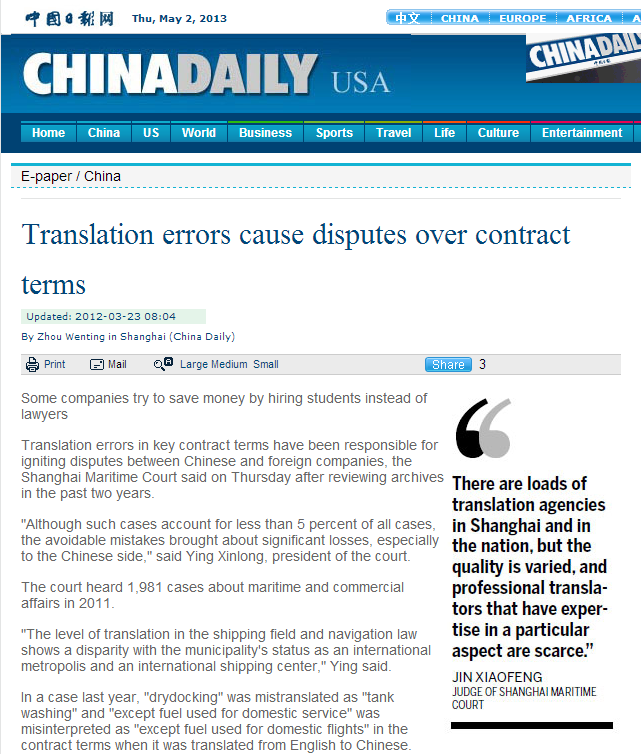 China Daily article explains how bad legal translations in contracts with foreign companies in the US are costing companies money and legal problems. An article from USA China Daily talks about the problem foreign companies are facing today from bad translations and how this cost them money and problems. They cite the common practice that many multi-language translation companies use inexperienced students to do their translations when they should be using lawyers to do chinese contract translations. They do this to save cost and increase their profit at their customers expense in quality and liability. 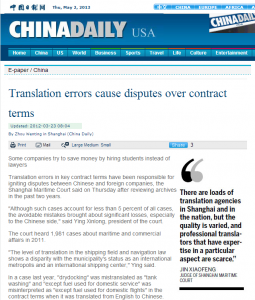 These errors account for 5% of all the contract dispute cases in China according to Ying Xinlong, president of the court. We are experts in Chinese and English legal translation and have law degrees in both countries. Let us help you avoid these kinds of problems with your contracts and be successful doing business in China.